Shop online for 114 guillows at discounts up to 70%. R/C Airplanes is the most popular of the 3 guillows categories, then Toys & Games, and Building Supplies. 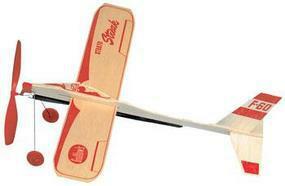 Easy to fly rubber powered airplane by Guillow's. Guillows' Folding Wing Gliders are all balsa, free flight gliders that are easy to assemble. 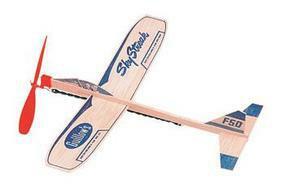 The Strato Streak is a Rubber Powered Balsa Motorplane from Guillow's. Suitable for Ages 10 and Older. Build the "Spirit of St. Louis" with this 3/4" Scale Balsa Construction Kit from Guillow's. Scale Model For Adult Collector. These are Guillow's 7" green rubberbands, to be used with many of their own rubber-powered planes, or any other plane kit which calls for a 7" rubberband. This is the P-51 Mustang US Air Force WWII Fighter from the Scale WWII Fighters Series by Guillows. Suitable for Ages 10 & Older. Assemble a Supermarine Spitfire Mk-I Britain's Greatest World War II Fighter with this authentic scale Rubber Powered flying balsa model kit from Guillow's. Scale model for adult collectors. 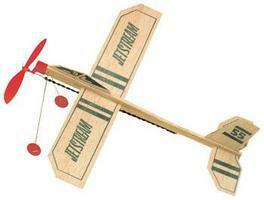 The Flying Machine is a Rubber Powered Balsa Motorplane from Guillow's. Suitable for ages 10 and older. This is the Build-N-Fly Cadet from Guillows. This is a Hand Launch Rubber Band Powered Airplane. Skill Level 2, good Second kit. 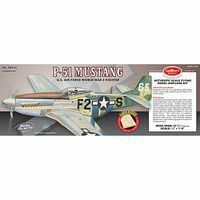 Build a Scale Rubber Powered North American P-51D Mustang with this Balsa Construction Kit from Guillow's. Scale Model Suitable for Ages 10 and Older. This is the Piper Super Cub 95 Airplane from the Private Planes Series by Guillows. Suitable for Ages 10 & Older. This is the DHC-2 Beaver Airplane from the Private Planes Series by Guillows. Suitable for Ages 10 & Older. This is a Package of Three 4" Plastic Propellers from Guillow's. 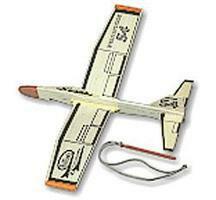 GUILLOWS JETFIRE GLIDERS- All balsa, free flight gliders, easy to assemble. 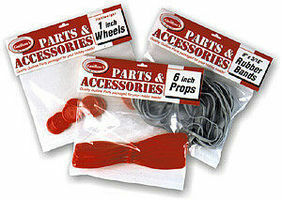 These are Guillow's 6" hi-impact plastic props, which can be used for a variety of hobby needs. The "Javelin" is a Build-by-Number Balsa Wood Construction Kit from Guillow's. Rubber Powered Endurance Flyer Suitable for Ages 10 and Older. A Guillow "Junior Contest" Flying Model Airplane. This is the P-40 Warhawk Famous as "Flying Tiger" WWII from the Scale WWII Fighters Series by Guillows. Suitable for Ages 10 & Older. Build the Boeing B-17G Flying Fortress US Air Force World War II Bomber with this Giant Scale Balsa Construction Kit from Guillow's. Scale Model for Adult Collectors.